Mount Picketpost, east of Apache Junction, AZ. our front door view. Winter Solstice has past, Christmas has pasted, days grow longer. It feels like “vacation time” here in Arizona. Most people I meet are for the most part “snowbirds,” with a more relaxed, casual out look on life. The harshness of weather and stress of work has been removed. More time for leisure. Yesterday I spoke with a lovely retired couple, as cute as could be, from Vancouver, British Columbia, Canada – spending 4 months in the Mesa, Az. area. They wore shorts, had backpacks on and were out hiking the Arizona Trail. But square dancing was their thing. If I am correct the fit looking older gentleman and his lithe wife of many, many years told me there were 100’s of square dances happening this winter in the Mesa/Apache Junction area. By the looks of it dancing was most certainly keeping this couple youthful with sparks in their eyes and a quickness in their steps. After leaving the Sonotia area we traveled west to Tubac where we overnighted at “Freedom on the Go” horse motel. We visited the exhibit at the Presido State Park in Tubac. Rosie looking on with interest. Then we drove to the near my National Park of Tumacacori. Fascinating! Then we headed north for the Catalina State Park where we rode and overnighted two nights. One thing I am noticing more is that volunteers are picking up the slack where funding has been cut. This park as are many are being maintained with the sincere help of many volunteers and they are doing a not worthy job of it all. Horses wanting their morning Source Micronutrients. Rosie’s guard dog and pal, Bella. From Catalina we went further north where Melissa Deaver-Rivera hosted a talk at her stable with friends from her riding club in Apache Junction… Had a lovely evening. 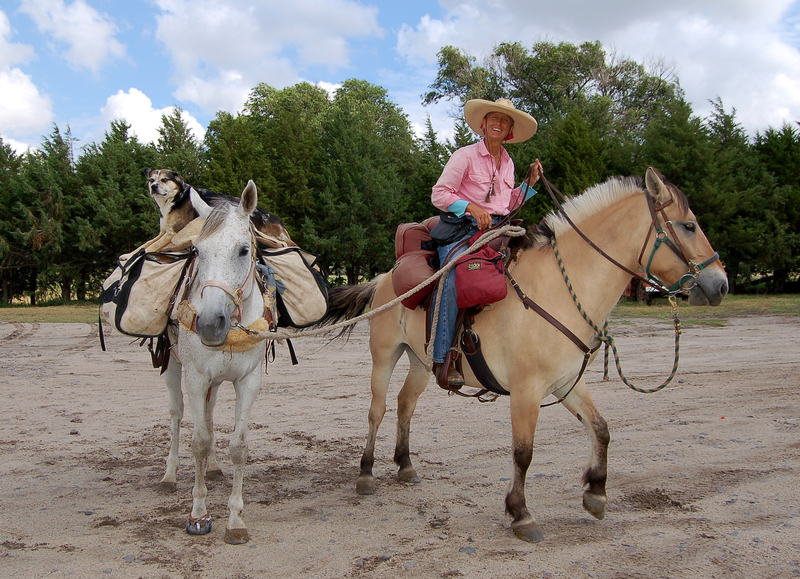 Melissa is a member of the BackCountry Horseman and knows my sister MaryAnn from the Pecos Chapter in Albuquerque, NM. Now here we are..Rosie on Spirit with the Superstition Mountains in the background riding the Arizona Trail. Christmas day 2017 in camp.